What a wonderful card & such a terrific idea !!! That's what I need to do as I have such good intentions & then come Christmas time I have not made or sent one Christmas card ... I admire you all. Love this card Sylvie. Would like to know where the snowman is from if anyone knows! 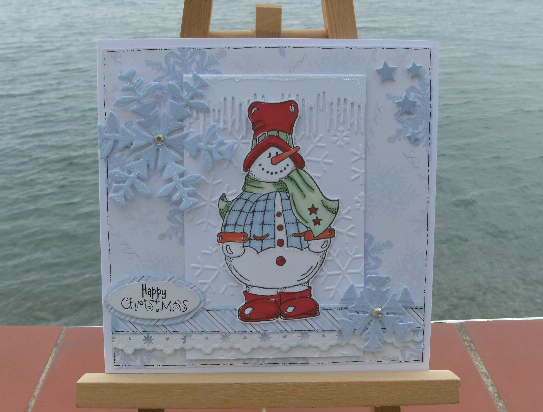 Great embossing snowflakes and icicles. 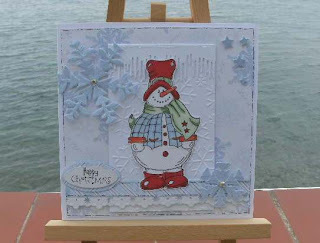 Great card Sylvie, such a cute snowman....you would also join the Bah Humbug challenge where they also make a christmas card but every week...your pile oc christmas card will soon grow. What a little beauty Sylvie, that happy chappy snowman is great and your colouring is beautiful!